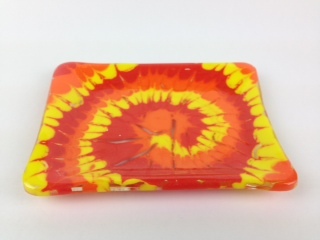 Red, Yellow, Orange, "Groovy Spirals" Tie Dye Glass Soap Dishes! 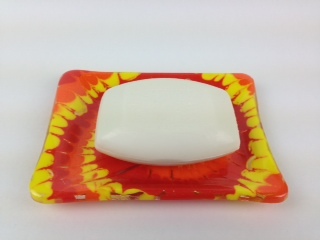 This Tie Dye Glass, Hand Crafted, Art Glass Soap Dish makes a great gift that can be used to decorate a bathroom or kitchen with functional art. Re-discovered old world techniques are combined with colored glass enamels to create our fantastic Tie Dye Glass designs. Each piece is fired in one of our kilns to about 1500 over 24 hours. Next we grind each soap dish by hand to create a smooth edge that prevents chipping. Our soap dishes are fired a second time over 24 hours to create the final shape. 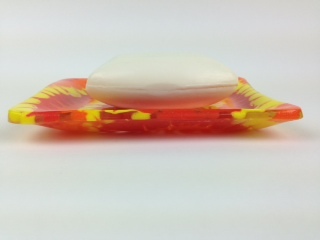 Our soap dishes measure 4" x 5" x 1" & weigh 9.5 oz. 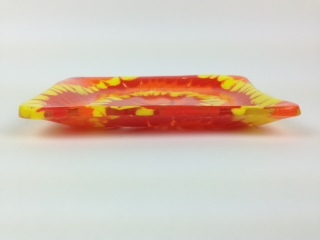 Our Tie Dye Glass Soap Dishes are available in a variety of designs and color combinations. 100% non toxic and food safe, microwave and dishwasher safe. Not safe for use in ovens. Handwashing is recommended. Handmade in Portland, Oregon by glass artist "Stanman". Each handmade glass soap dish is unique so slight design variations occur. Copyright © 2015 Groovy Art Glass, L.L.C.